Justin's WeatherTalk: Are you ready for some rain? Yesterday was interesting, since an upper level disturbance brought us surprise afternoon clouds, but the high temperature jumped to 69F. Despite the critic in Starbucks this morning- it not "That Global Warming". Today's high of 85 was set in 1921, and we will be likely to get back to near 60F. In fact, a round of rain has been developing to our west and will continue to spread through Maryland today. A little more impressive than I earlier though: Rain (steady for a few hours) vs. Showers (hit or miss and lasting minutes to less than 1 hour). , but I would assume it would bump our rainfall estimates up. The second wave with a .99 near Chicago will reach us tomorrow night and may linger into Saturday lunch hour. A touch call on that timing now, but these boundaries do not have much push to them this time of the year, so they can stick around. 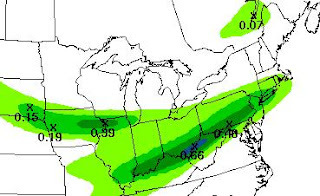 My bet is on steady rain returning and most impressive for us Friday afternoon and night. We could make a dent in our 2 inch deficit. The only issue will be with temperatures. It will be snow in NY state and New England, with 60s and 70s to our south. A big gradient, but for us the spread could be from low 60s to upper 40s. That gradient may be the difference from York, PA to AA County either today or tomorrow with the biggest bust potential.